Prairie Grass Cafe is sharing their recipe with us for ‘Three Sisters Garden Heirloom Luxury Pie Pumpkin Soup.’ They get their Heirloom Luxury Pie Pumpkins from their local Three Sisters Garden. Heirloom Luxury Pie Pumpkins are a lovely golden fruit with white netting, typically in the 6lb range and perfect for pie making. In fact, this is one of the best tasting pie pumpkins you can use; with very sweet and smooth flesh, it’s a favorite of all who use it,” according to SeedSavers.org. 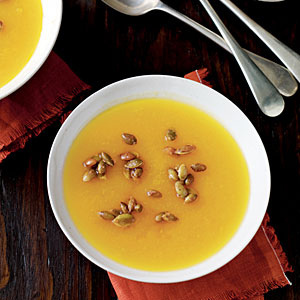 You are sure to love the smooth silky texture and intense pumpkin flavor of this pumpkin soup! In a large soup pot sauté the pumpkin in the olive oil with the onions, thyme, bay leaves and salt. Cook over medium heat until the onions are transparent. Add the chicken stock and simmer for 30 minutes or until the pumpkin is tender and the liquid reduces by about a ¼ of it’s original volume. Serve hot the Heirloom Luxury Pie Pumpkin Soup with toasted pumpkin seeds and popcorn. I hope you enjoy this festive recipe for Heirloom Luxury Pie Pumpkin Soup and it puts you in the fall mood. I don’t know if you know this already but pumpkins are really healthy for you! Pumpkin is rich in fiber and with three grams per one-cup serving and only 49 calories, it can keep you feeling full for longer on fewer calories. A fiber-rich diet seems to help people eat less, and thereby shed pounds. Plus pumpkins are packed full of vitamins and nutrients! A cup of cooked, mashed pumpkin contains more than 200 percent of your recommended daily intake of vitamin A, which aids vision. Pumpkins are also high in the antioxidant beta-carotene, which may play a role in cancer prevention, according to the National Cancer Institute. Thanks again to the Prairie Grass Cafe for sharing this recipe with us!